There’s a form of human radar that detects the connection between nippy nights, shortened days, creeping spiders, and a tremendous craving for comfort food – the way Mom used to make it. 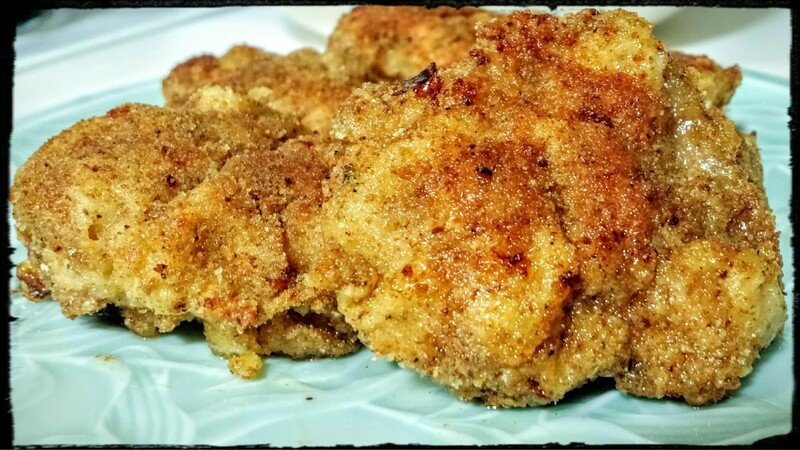 Breaded chicken has been our family’s comfort food of choice for generations beginning well before my birth when Grandma Salopek served it to her family for Sunday dinner. I’m sure she also served it to special guests, extended family, and to the boarders she housed for so many years below the tracks in Duquesne. She loved to cook and would often begin the much anticipated meal with homemade chicken soup and dumplings followed by: salata with vinegar and oil, mashed potatoes smothered in butter, fresh corn, and breaded chicken baked to perfection. Without fail, dessert was always some sort of strudel. For some reason the strudel-making gene was not passed on, to me at least, but I have done my best to profusely spread the love of breaded chicken to future generations. Interestingly each family adapts the recipe with their own modern twist. Whether it’s made with lean chicken breasts, savory chicken thighs or bite-sized chicken nuggets is up to the taste buds of each family. One daughter crushes milk-free croutons in the food processor to make her own bread crumbs. This is reminiscent of my mother making her own bread crumbs back in the 1960s and 70s. Mom would race over to Duquesne Village Shopping Center whenever white bread was on sale for 10 cents a loaf and grab as many loaves as she could. She cubed all those loaves of bread and laid them out to dry on a cookie sheet. When it was time to make crumbs from the dried bread, she would use a hand meat grinder that attached to the kitchen table. She cranked out enough bread crumbs for a year’s worth of Sunday dinners! Grandma, of course, didn’t use a recipe, but here are the basic steps to cook up a little comfort for your family. Amounts of ingredients are approximate, but there should be enough of each ingredient to make a cookie sheet sized baking pan with one layer of chicken pieces. You may need to adjust the amounts to accommodate your taste and the size of chicken pieces used. Rinse chicken pieces. Put a thin layer of oil across the bottom of a baking pan. Completely cover chicken piece with the flour mixture. Completely cover floured piece of chicken with the egg mixture. Completely cover floured/egged piece of chicken with breadcrumbs. Place each breaded chicken part onto the oiled pan as it is prepared. Cover with foil and bake at 350 degrees for 1 hour, turning once. If making smaller chicken nuggets, decrease the time to approximately 40 minutes, turning once half way through baking.